The four major takeaways from a recent Track 1.5 diplomatic forum hosted by Tsinghua University. Compared to 2012 and 2013, the security environment surrounding a “rising diva” like China has become more intense, including both spirited words and deeds by participating states. This includes China’s declaration of an Air Defense Identification Zone, tensions with Vietnam and the heated exchange between U.S. Secretary of Defense Chuck Hagel and the Deputy Chief of the PLA, Lieutenant General Wang Guanzhong, at the Shangri-La Dialogue. As Russia and the West clash over Ukraine, there is a burgeoning realignment between Moscow and Beijing with immense strategic implications for the “global order.” For all these new dynamics, the major debates of the 3rd WPF offer insights on the current foreign policy concerns as well as the strategies that Beijing, Washington, Moscow, Tokyo and other influential actors are pursuing. Four key areas took center stage at WPF this year. First, the discussions about “a new type of major countries relations” (新型大国关系) showed the need for increased operationalization. American and Chinese participants spent a great deal of time discussing President Xi Jinping’s plan to avoid the Thucydides’ trap. During his keynote public speech, Steven Hadley, the former U.S. National Security Advisor under George W. Bush, expressed his concerns that recent Chinese behavior had undermined Beijing’s commitment to Xi’s declaration. His statement drew major criticism from some in China, but also invited sincere questions about concrete advice to overcome the shortfalls in Sino-U.S. relations. Hadley himself later highlighted that it is not too late, noting that continued Sino-U.S. engagement in science and technology could positively influence public opinion in both countries, promoting a more cordial interaction between the two economic behemoths. Both sides agreed that increased operationalization and measures to build political trust are necessary for the relationship to proceed smoothly. Second, the strategic alignment of Russia and China became evident in major panels. Following a significant natural gas pipeline deal, and in light of the ongoing Ukraine crisis, China and Russia are more eager than ever to convince the world of their deepening friendship and level of trust. The former Secretary of the Russian Security Council, Igor Ivanov, emphasized stronger Sino-Russian relations and the role of the Shanghai Cooperation Organization as a regional forum for cooperation. These became major areas of discussions during the panels. As he highlighted, the multipolarity of the 21st century still needs to be defined and conceptualized. Judging from the number of high-level Russian participants at the WPF, the two countries seem to be committed to playing a major role in this process. Whether during the general panels on Sino-Russian relations or in more specific ones focusing on cyber security, Chinese and Russian experts showed a surprising level of agreement on a diverse range of issues. Although the usual consensus against U.S. policies could be observed in prior years, the conviction that there has been major improvement in bilateral relations became more evident this time around. Third, maritime disputes were at the center of attention during the WPF, but few new solutions were presented. Forthright discussions about maritime security and territorial claims between the actors involved are needed more than ever. Most panelists on these issues, however, came from China’s “friendly” neighbors (although it’s unclear whether the conference organizers selected only these individuals or if panelists from other countries refused to participate). Apart from Japan, states such as Vietnam and the Philippines were missing from the debates, which limited these discussions. With over three panels on maritime issues, much focus was given to well-known discussions about historic claims, the destabilizing role of the U.S. in the region and the different interpretations of the UN Convention on the Law of the Sea. Chinese experts highlighted that unilateral attempts for arbitration procedures were not a solution to the territorial disputes, and instead insisted that the focus should be on peaceful bilateral negotiations and further discussions about the existing Declaration on the Conduct of the Parties in the South China Sea. Beyond such predictable statements, various discussants highlighted the need for a new security architecture in the region, which was questioned by Japanese and American participants, who pointed to existing forums. Due to the aforementioned constellation, many arguments remained unchallenged and a superficial consensus dominated the panel discussions. More diverse stakeholders will need to be enlisted for there to be a more productive outcome next year. Fourth, the panels and speeches addressed uncertainty about the Middle East and Afghanistan and the realization that the coercive state building attempts of the West did not work and have in fact exacerbated the existing religious and societal clashes. In light of ISIS’s recent conquests in Iraq, the panelists and speakers agreed that there is a major risk of regional instability. As a consequence of increased trade with and energy imports from this region, China’s focus on the Middle East is increasing. Several speakers highlighted the importance of such a focus, given that domestic unconventional oil and gas production is making the U.S. energy independent, and thereby less interested in the Middle East – however flawed that logic is. Attention was additionally paid to what the U.S. troop withdrawal from Afghanistan will mean for China, both in terms of its investments in the country itself and the possible repercussions the withdrawal will have for China’s growing terrorism problem. With “mutual trust” being part of this year’s theme, the assessment by former U.S. Deputy Secretary of State Richard Armitage that “Asia lacks trust” highlighted how important such gatherings are. 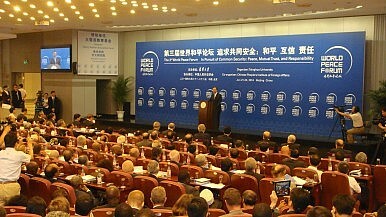 It is thus promising that scholars in China and a leading university like Tsinghua are promoting Track 1.5 diplomacy, looking to ensure that peace and stability will not fall victim to the old lines of nationalism, revisionism or “miscalculations and accidents.” The goal of achieving collective security and peace will be a strenuous undertaking to say the least, but with equally high dividends if accomplished. Leading participants mentioned Thucydides’ ominous prediction about the fear that a rising power causes and the inevitability of a clash with the established power as yet another reason for the need for caution and restraint. Dialogue during such high level forums can facilitate concerted, creative and committed actions towards peace. This endeavor will not be easy, but certainly the networks established and the interactions of senior officials at the WPF are a step in the right direction of trustpolitik and peace in our time. Frauke Heidemann, Patrick Renz and Vasilis Trigkas are Non-Resident WSD Handa Fellows with the Pacific Forum CSIS. The authors have worked and studied in the EU, the U.S. and China and recently completed a Master of Law in International Relations & Chinese Politics from Tsinghua University. The annual event is devoting more and more focus to Asian issues.